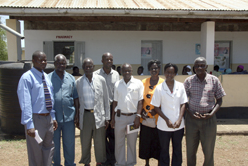 This Health Centre is located in a region called Gembe East - in Nyanza province of Kenya. The area is one of the poorest in the country, has very high HIV prevalence rates as well as high rates of infant and maternal mortality. The clinic we visited is a well-run community clinic with many people attending. There are two registered nurses who provide care and a local board of trustees who oversee management of the clinic. The region is dry. When we visited in February 2011, the region had received no rainfall for over four months. There is no source of piped water so they are dependent on conserving rainwater. The rusty, leaky water storage tank needed replacement. There is a well about 500 metres from the clinic but the water from it is salty, unpalatable and unuseable. In early 2011 the well was dry and in disrepair. 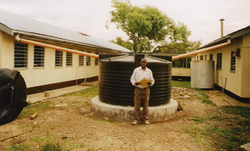 In 2010, CAART funded two phases of rainwater collection by installing eaves troughs on two buildings and providing three collection tanks.
" The tanks are operating well. All are full with water from rain that we had in November. Water from the 6000 litre tanks is used by inpatients in the wards. It is drawn, treated with chlorine, and stored in containers for patients to use next to their beds in the wards. Water from the 10,000 Litre tank is used for general laundry work in the clinic." 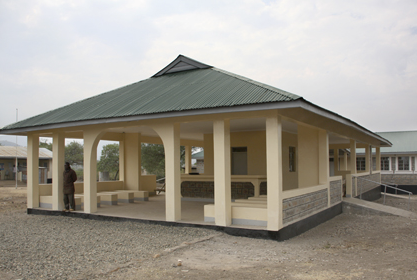 Last year, the Ministry of Health constructed a beautiful new hospital ward and administration block for the Clinic. Alas, water provision was not included in this project development and the clinic is looking to construct a rainwater catchment system for this new pair of buildings. CanAssist hs agreed continue to support the clinic by continuing to develop provision of clean water for this new wing. The first phase of this will supply two 10,000 litre tanks and will cost approximately $6600 CAN. 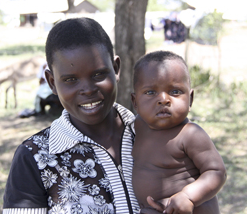 This project addresses needs in both health and sanitation. Having access to clean water is imperative to run a clinic. With no clean water source staff are unable to bathe patients who are ill and fevered or wash their hands after examining a patient. Clean water is needed for drinking and sanitation for both patients and staff.